Of the “3 Keys to High Traffic Field Maintenance”, Traffic Management should be considered just as important as the first key: Aggressive Cultivation. (Key 1: Aggressive Cultivation). Creative traffic management alone can give a high traffic field with limited maintenance a chance for survival. With its importance, traffic management could be considered the most challenging key. Why? Because traffic management involves communication and cooperation from 2 sides: Field managers and field users. However, the communication and cooperation can curb field deterioration more than aggressive cultivation or nutrient management. Managing traffic effectively will allow all fields to meet the needs of the users and require less repair work. When the field is not being used for competition, goals should never be in competition place. Avoid the temptation! Avoid installation/ use of permanent goals. New style portable goals look identical to permanent goals. If permanent goals are desired, install extra sleeves or have portable set for different positions. Ultimately extra lines on a field for practice/ training would be best avoided. 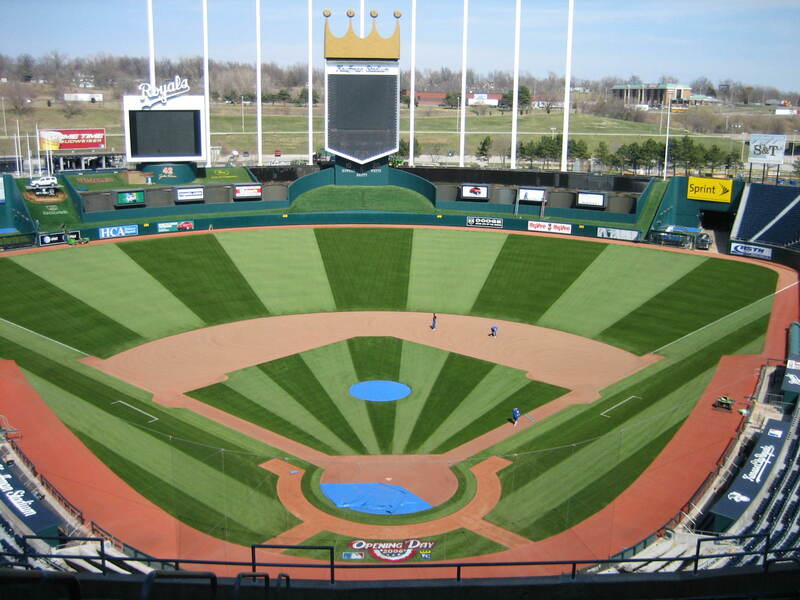 But in the age of multiple sport synthetic fields, a wide array of colors and lines is already accepted. 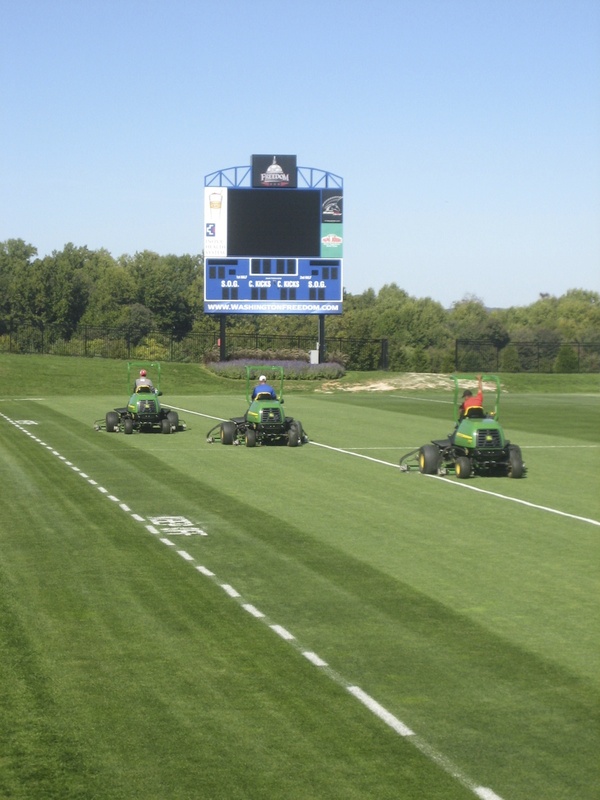 On grass, lighter paint application and timing for paint application for lines to fade or be mowed provides assistance. Re-sizing and shifting field layouts moves high traffic areas and provides the embattled turfgrass in those areas a chance to recover. 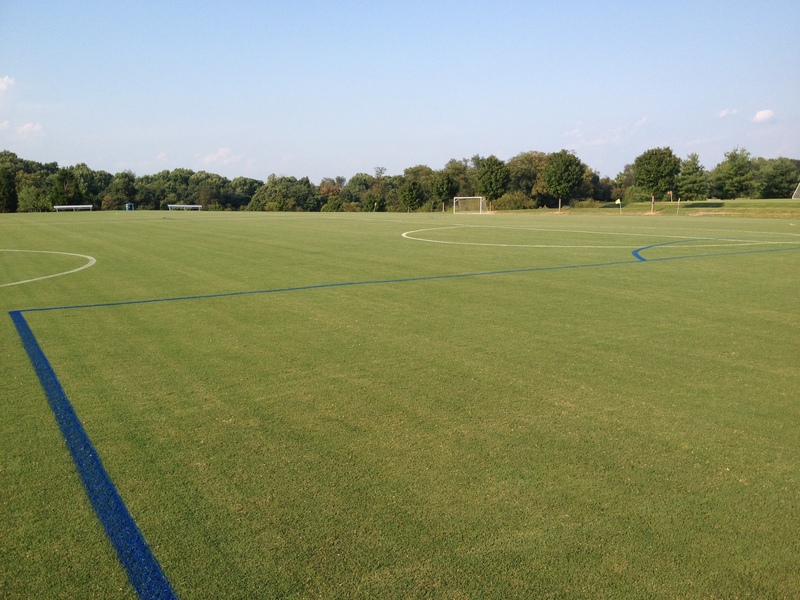 Soccer and lacrosse fields have the most flexibility for re-sizing and shifting because the rules call for minimums and maximums on the competition dimensions. Start with shifting the center of the field. 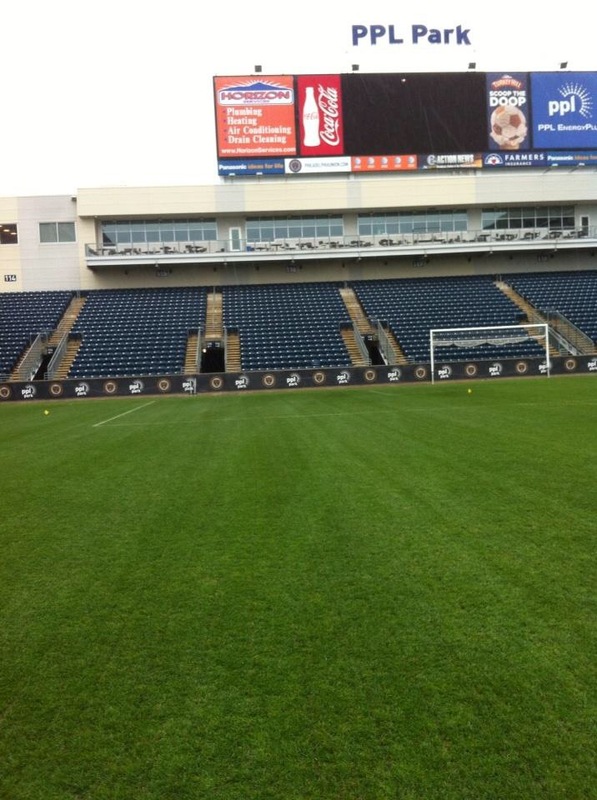 High traffic areas such as goalmouths, referee lines, and bench areas get moved with the move of the field center. The foundation of traffic management is communication and cooperation. Field managers and users should be in constant contact to ensure there are no surprises from other side. Both sides should strive to be respectful and understanding of the needs of the other. With that, the days of field managers dictating to coaches how the field gets used are gone. The “stay off the grass” mentality creates negativity and resentment while promoting an environment of disrespect. In that environment neither the field nor the team wins. Field managers that are flexible to support and cooperate with user’s needs while communicating in a positive manner create education and empowerment. Coach’s equally should reciprocate and respect the work of the field manager. When the cooperation and communication is mutual, everyone wins with traffic management. Especially the field! The success of “managing traffic” will be evident in increased quality of a high traffic field. With the extra work that goes into the cooperation and communication and field movement, sod work and field closures for repairs will be reduced and/or eliminated. And as your own traffic management process evolves, the condition of high traffic fields will continue to improve as you discover new ideas and try different approaches that fit your specific situation. The fall Ohio STMA newsletter is out! 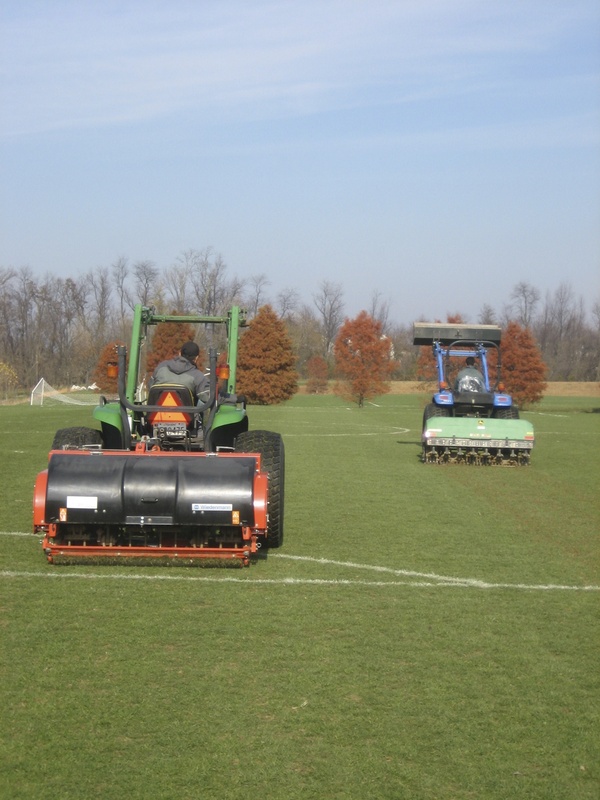 As part of the article “Pro-Active Solutions for Fall Field Overseeding”, the following 2 case studies were posed. The case studies allow readers an opportunity to interact and apply their own pro-active solutions to real world challenges. Author Jerad Minnick will follow up on Monday Sept. 15th at 6pm EST with his own feedback on possible solutions. This field manager has the ultimate challenge in order to get new seed established during the busy season of the year. This field will experience high traffic through the fall even through the time it goes dormant. If you were that manager, what would you do? Take 5 minutes to create a solution and share it with your colleagues on twitter to @OSTMA and @JeradRMinnick, hash tag #fallseeding. I will share some solutions via GrowingGreenGrass.Net to @OSTMA and @JeradRMinnick on Monday September 15th. 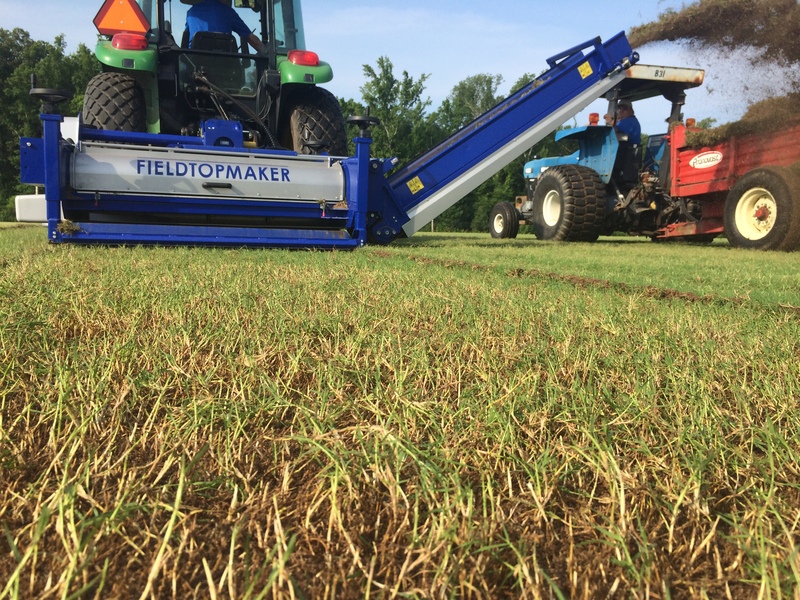 This field manager may feel relief for the end of the season, but fall overseeding will be the catalyst for the field’s survival through a busy spring and summer. This field will be exposed to high traffic even before the grass breaks dormancy in the spring. If you were that manager, what would you do? Take 5 minutes to create a solution and share it with your colleagues on twitter to @OSTMA and @JeradRMinnick, hashtag #fallseeding. I will share some solutions via GrowingGreenGrass.Net to @OSTMA and @JeradRMinnick on Monday September 15th. Jerad Minnick is an international natural grass advisor and educator. Follow him on Twitter at @JeradRMinnick and find more ideas at GrowingGreenGrass.Net. Come interact in person with Jerad when he is a speaker at the Ohio Turfgrass Conference in December. (Note: 3 Keys To High Quality, High Traffic Natural Grass fields is copyright of the Natural Grass Advisory Group and Growing Innovations). 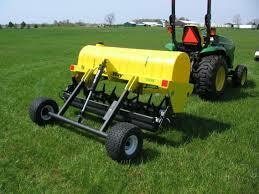 Concentrated foot traffic can quickly compact soil on grass fields. Compaction eliminates air space and leads to suffocating roots. The gasping roots weaken and the sword of grass to begins to thin out. Thinning, along with a sod or organic layer compound compaction leading to divots and blowouts. Weak roots require additional hydration, yet water from irrigation and rainfall is not able to penetrate the compacted soils easily. A compacted field surface is a Sports Field Managers nightmare! Cultivation solves the problems caused by compaction and yields increased turfgrass density and decreased water usage. Because water is better able to move through the soil profile, it also decreases the number of events cancelled due to rainfall. However, on a high traffic field, the traditional “basic” approach to cultivation of a few times a year is NOT enough. A field under continual foot traffic requires continual aggressiveness with cultivation. Yes, historically it has been taught that cultivation only needs to take place these few times a year. And many times cultivation is avoided in a fear of actually causing more damage to a field. Especially during times that the field in experiencing heavy use. However we know the damage that compaction and surface hardness can cause. Now GMax, compaction testing, and infiltration rate data all paints the picture for us even more clearly. Limited, conservative cultivation has lead to the current public perception that natural grass surfaces can NOT sustain heavy use, need long periods of rest, and are rained out easily. AvoidIng the fear to be aggressive while using good judgement on how and when now has evidence on counteracting those compaction issues and actually increase use on a grass field. Dictionary.com defines the word “aggressive” as “vigorously energetic, especially in the use of initiative and forcefulness”. This definition is an excellent outline to use in your decision making towards cultivation. A cultivation program should be “vigorously energetic”: implemented a minimum of 2-4 times per month. It should show “initiative and forcefulness”: taking place in short windows of opportunity between events and in conditions that may not typically be seen as ideal. This could mean cultivating cool season in the heat or working all night right after an event in order to utilize a short break completely. Finding time when it seems that there is no time. 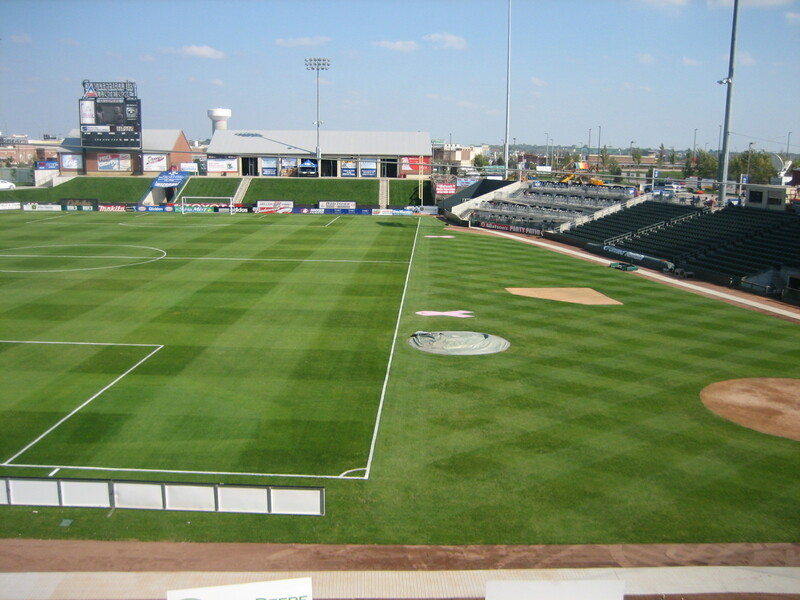 FC Dallas Stadium, a high traffic soccer and football field (2011 STMA Professional Soccer FOY) sets the standard for what it means to be “aggressive”. Sports Field Manager Allen Reed aerates his field every Monday. 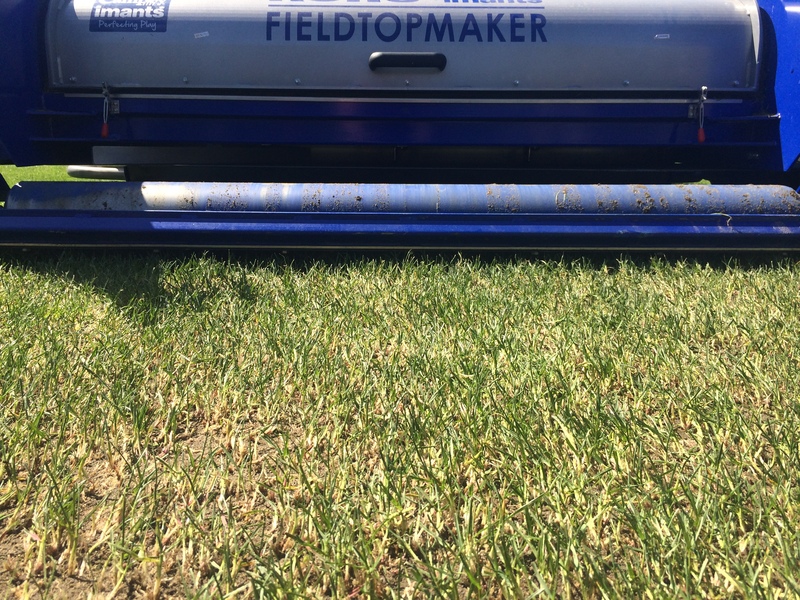 See More Here In a Feature He Shared With Us: How Our Grass Field Takes More! Nationals Park in Washington, DC hosts Major League Baseball, concerts, and a variety of cooperate and community events. John Turnour utilizes a form of cultivation between every single home stand. He even sometimes doubles up on his cultivation practices and averages nearly 3x per month. This aggressive cultivation keeps grass fields from experiencing turfgrass decline due to compaction. It also keeps water moving vertically through the field’s soil profile, increasing irrigation efficiency and reducing rainouts. Surface aeration another basic and accepted form of cultivation. 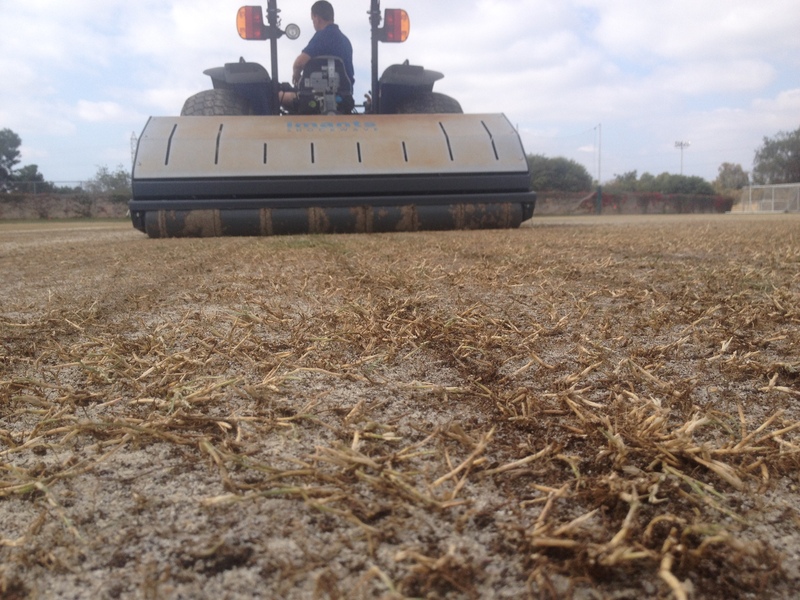 Rapid tine aeration machines can make shallow tightly spaced holes to open the surface and allow air into the soil. Needle tines, knife tines, cross tines, etc all offer different options. 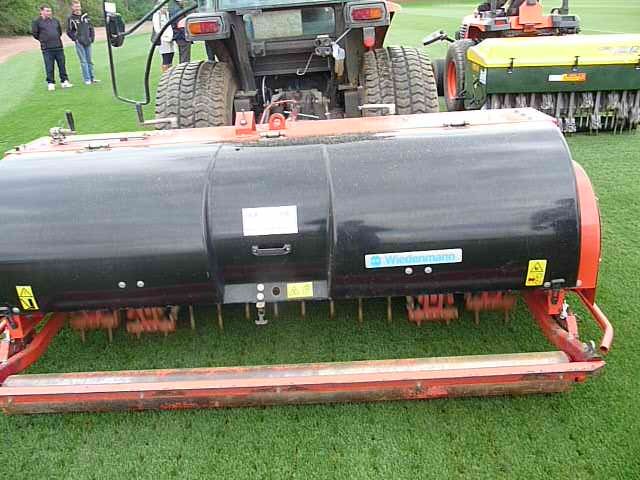 Coring tines not only open the surface, they remove organic build up and reduce layering from sod. Slicing and spiking also open the surface as well. Recycle dressing comes from a machine invented my Mr. Ko Rodenberg, former Superintendent of Park Maintenance in Rotterdam, Holland. 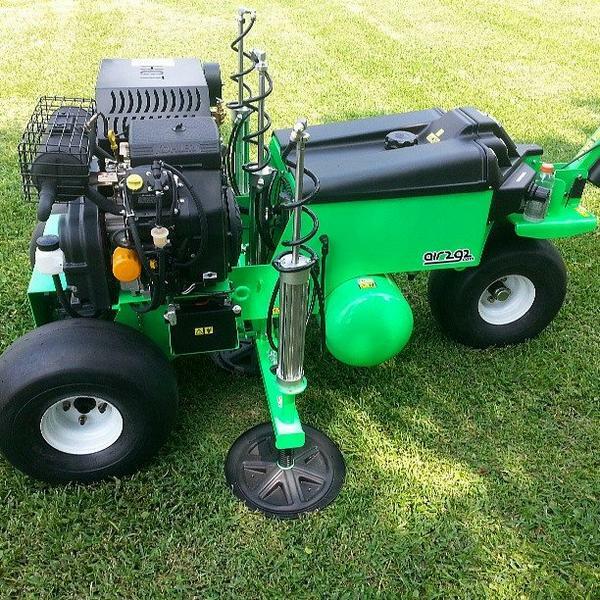 All in one pass, the machine is able to accomplish both de-compaction and surface aeration. The recycler de-compacts the sub soil by removing soil with cutting blades. The surface soil is then opened up with slicing blades. 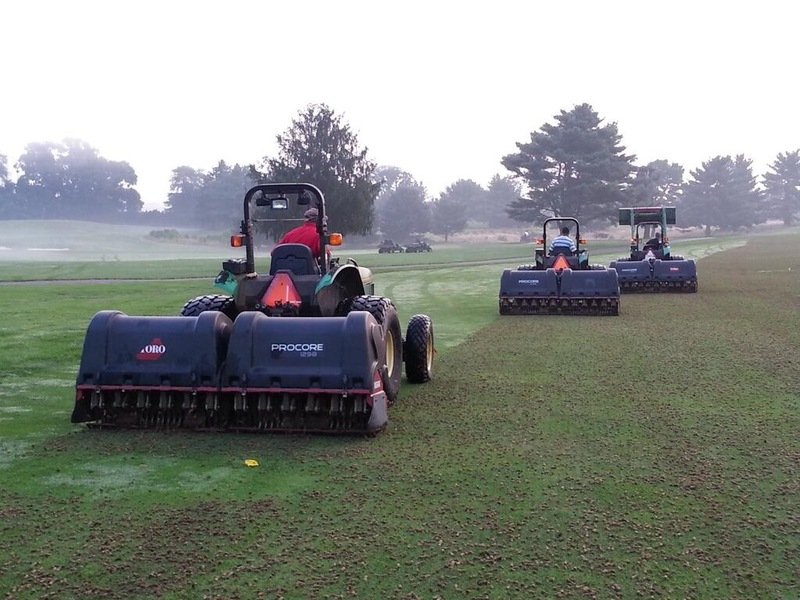 Finally the machine “recycles” the removed material over the top of the surface as topdressing to be dragged back in. Another unique and new form of aeration comes from air injection. Air injection machines force high-pressure air into the soil profile much like the former Toro hydroject force high- pressure water into the soil. The force of the air fractures even the hardest of soils to promote de-compaction and to re-introduce air into the profile. Brushing is a very simple practice, but the results can pay dividends. Brushing stands up the grass and fluffs a good amount of thatch to the top of the canopy. Blowing, sweeping, and/ or catching clippings will help when there is a large amount of material brought up. Verticutting is another basic and accepted from of cultivation for the attempted control of thatch and organic build up. 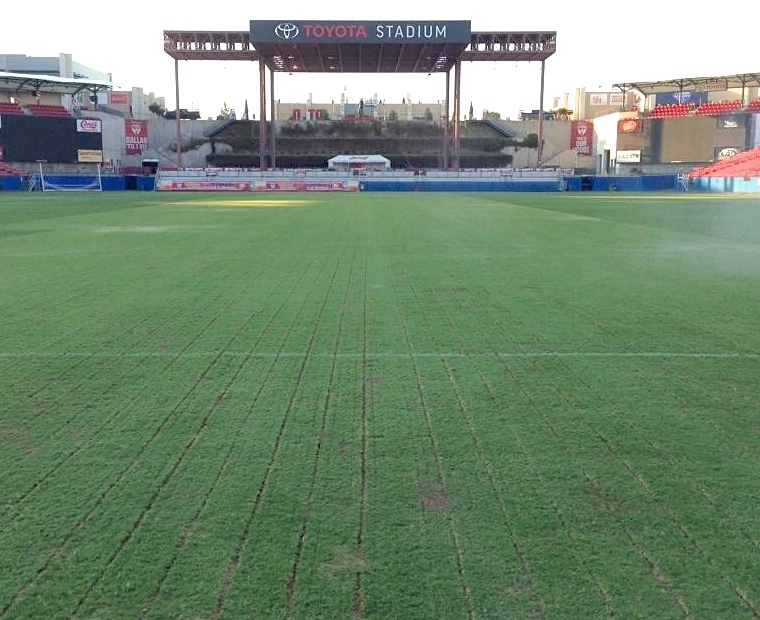 Verticutting also promotes density and durability. 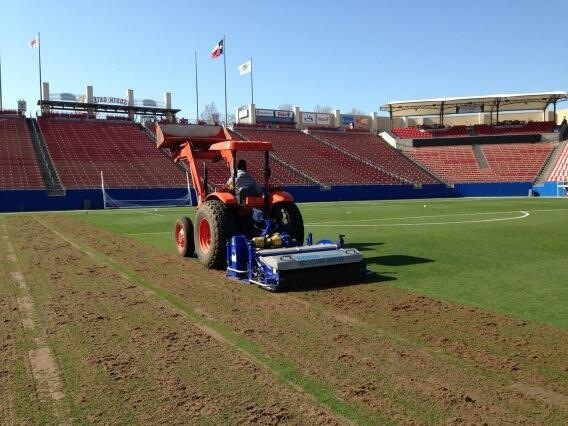 Standard verticutting removes around 11% of the material, so use this practice as much as possible. Especially on actively growing bermudagrass. 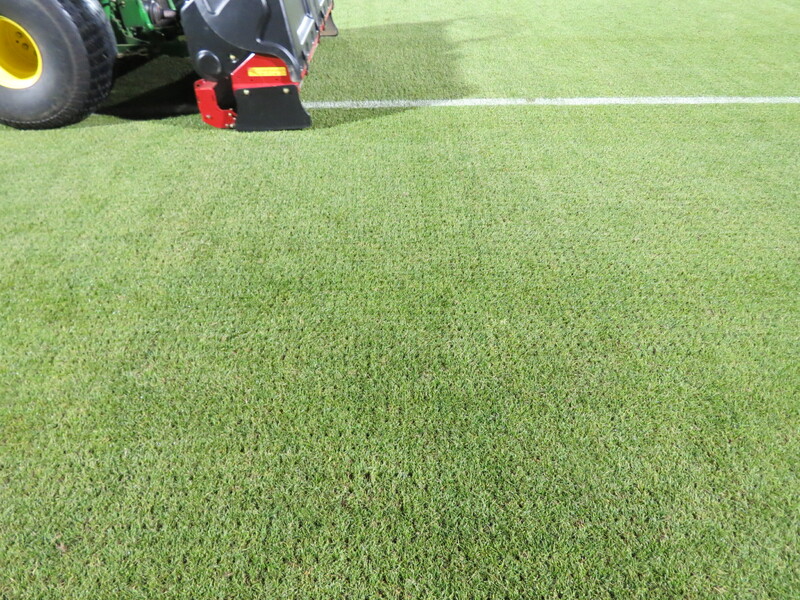 With the statistic of standard verticutting removing approximately 11% of the surface material, Universe fraze mowing has been introduced in order to remove 100% of the desired depth of thatch and organic build up. Universe mowing also removes weak poa annua plants, poa annua seed, and other weed seed as well. 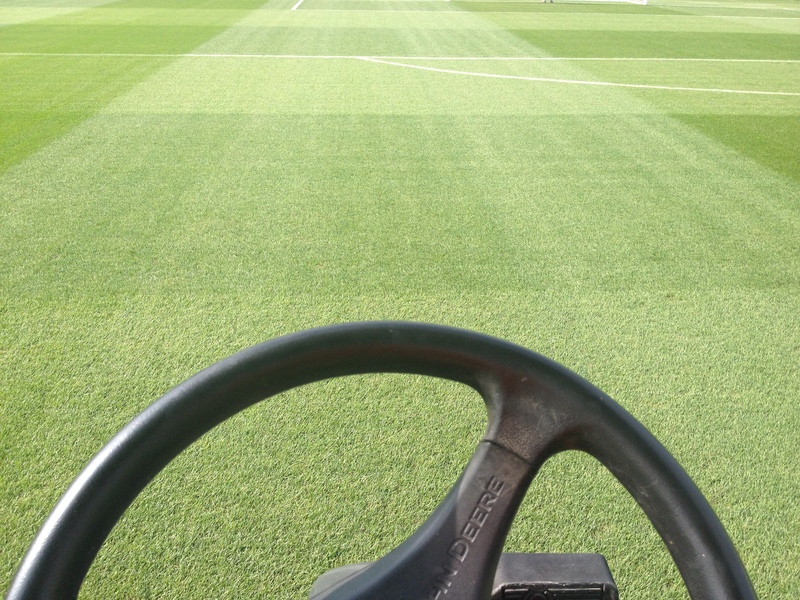 The regeneration from Universe mowing promotes density and durability, eliminates surface slickness, and creates a smooth playing surface as well. 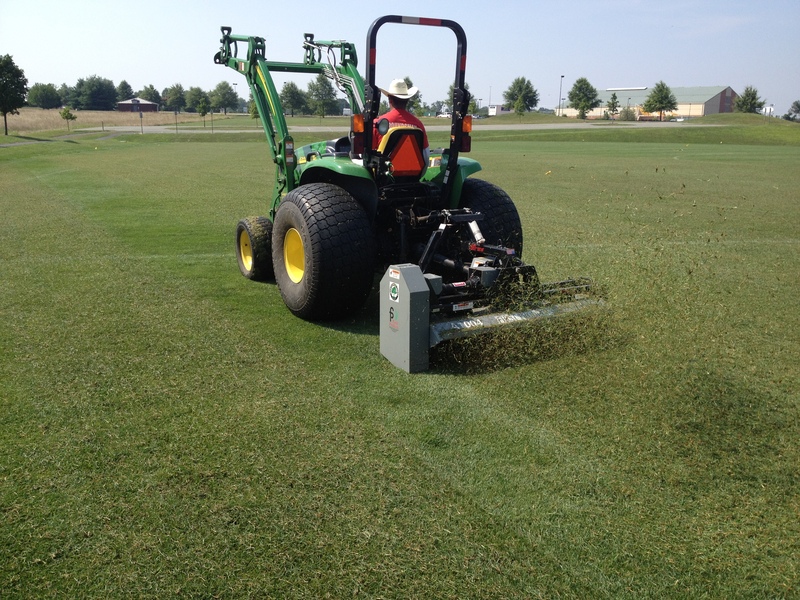 These practices, along with others, provide grass field managers with a wide range of cultivation techniques to implement as often as possible. Start small and expand. 1x every 2 months to 1x every 1 month is a 100% increase. This is great! If your salary was increased 100% today, think how happy you would be. Same goes for the grass plants. Yes, many times cultivation is avoided in a fear of causing more damage to a field. Especially during times that the field in experiencing heavy use. However we know the damage that compaction and surface hardness can cause too. AvoidIng the fear to be aggressive while using good judgement on how and when can counteract those compaction issues and increase use on a grass field. “Inaction may be safe, but it builds nothing.” Dave Freudenthal. Think different and take action. Grass fields can take more! 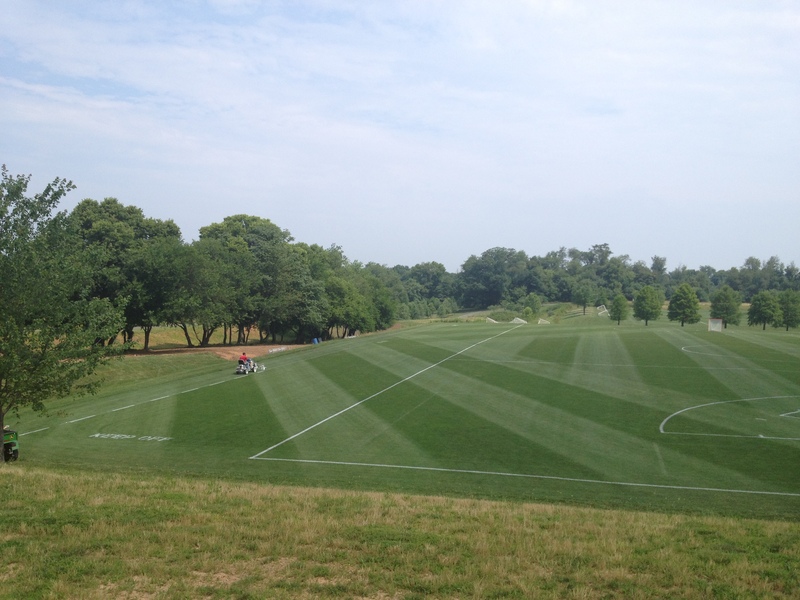 HGT Kentucky bluegrass under aggressive cultivation following 167 events in less than 6 months. FIFA President Sepp Blatter recently increased the international soccer governing body’s advocacy for synthetic turf. In an August 4th press conference, Mr. Blatter called synthetic turf the “future” for soccer. His statements not only played as a sales pitch for big business synthetic turf, they were complete slander against the natural grass and green industry of plants and sustainability. President Blatter took his bold statements all the way to suggest that grass soccer fields would become today’s grass tennis courts… that very few soccer matches a year will be played on natural grass. President Blatter’s statements about synthetic turf as the “future” for soccer are in no way based in fact. His statements are his opinion. Conversely, it can easily be argued that synthetic turf is not the future. In fact, it is possibly that synthetic turf could become completely obsolete for soccer surfaces sooner than later. Here are 5 reasons to why natural grass is not only staying in soccer, but why they are going to prevail from President Blatter’s un-factual assault. 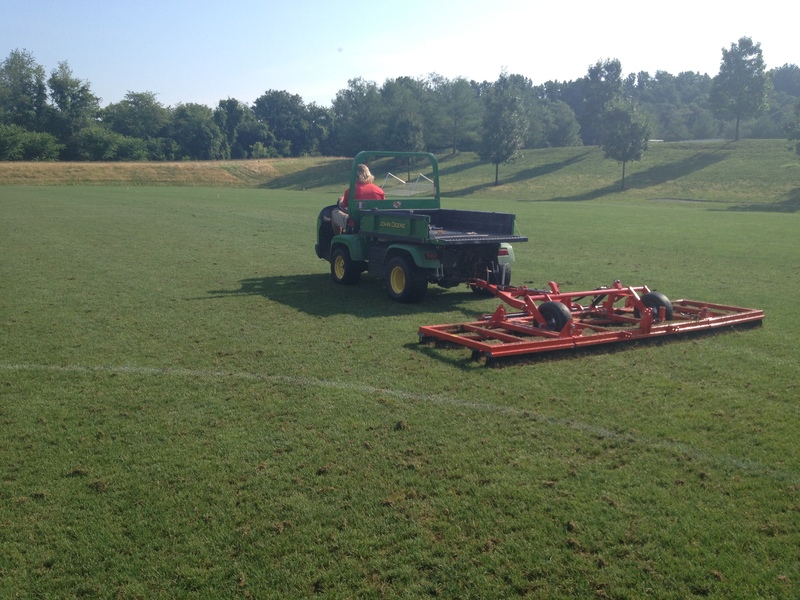 The tools used by Sports Field Managers to maintain and improve grass fields evolve daily. Creative thinking and technology are creating a wide range of innovation for natural grass fields. Grass breeding and genetics: The evolution of turfgrass varieties is dramatic. Improved grasses are available that can grow and recovers at double the rate of older varieties. 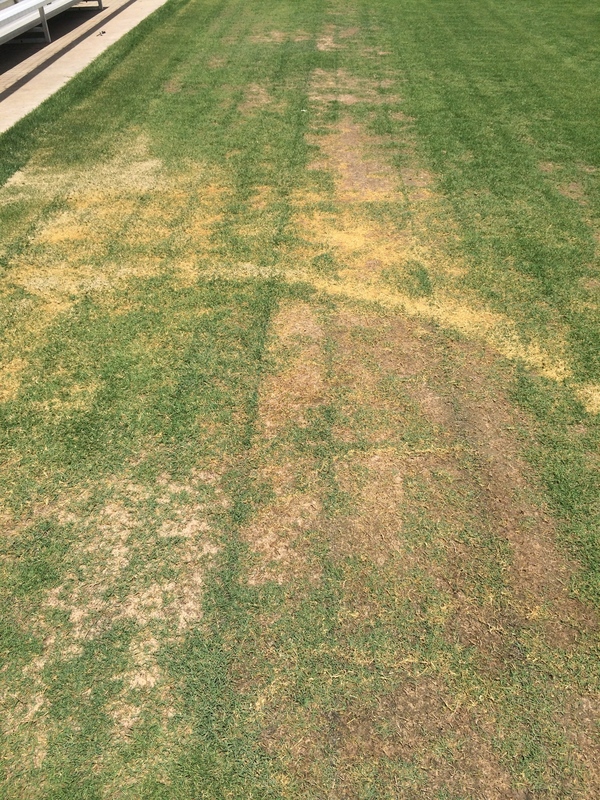 Better bermudagrass can sustain winters as far north as Philadelphia and will grow in the transition zone and southern regions for nearly 1 month longer than before as well. Seashore Paspalum can be watered using ocean salt water and requires very little sunlight. 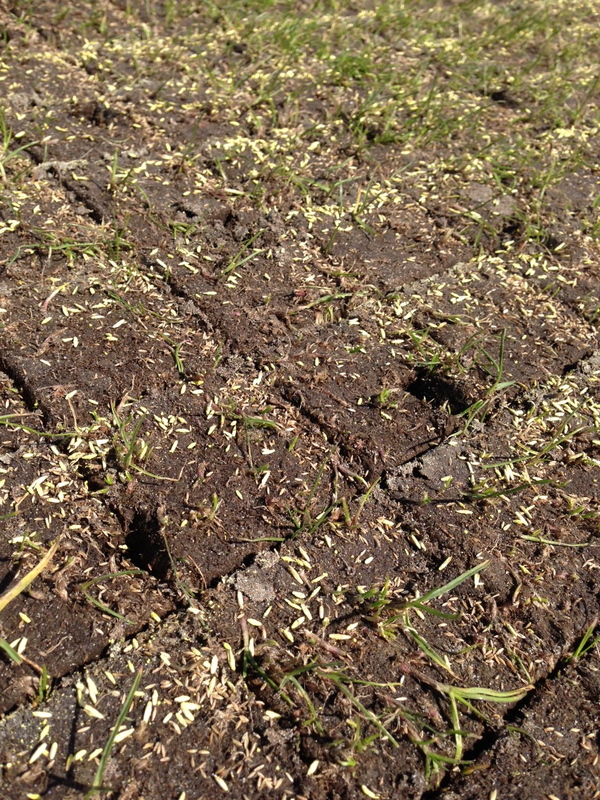 Cool season grass breeding has created Kentucky bluegrass seed germinates within 7 days of planting in order to establish a field in 5 to 7 weeks. Previously it has taken 3 to 6 months. Additionally, Kentucky bluegrass and perennial ryegrass are able sustain aggressive growth through summer heat and withstand disease stress. All of these better grasses require less water and sustain better growth into drought conditions. Technology for plant feeding and health: Environmentally friendly fertilizers have been and continue to be developed for even, sustained turfgrass growth. These products are created in cooperation with state and local laws to protect the environment while producing thick, strong grass stands on fields. Natural plant hormones and bio-stimulants are available to feed turfgrass plants holistically. These products stimulate natural growth and provide energy for plant health and recovery. Much like a healthy human on a balanced diet and exercise routine, grass plants on a prescribed maintenance program can be healthy and strong too. Think Gatorade, Red Bull, and Vitamin water for grass. Fiber Elastic: Polypropylene fibers for stability mixed with elastane pieces to absorb energy. The energy absorption reduces field compaction and cuts down on the injury potential of the players using the field. XtraGrass: Natural grass growing through a 3” biodegradable mat of synthetic fibers to create surface stability, traction and player safety. Desso GrassMaster: Stability fibers sewed into sand to provide stability, traction, and player safety. These are just a few examples of many innovative products available for natural grass fields to sustain heavy traffic and advance player safety. New grass genetics and plant health technology in combination with the safety and durability products create the foundation for strong natural grass fields. The human element is the final reason that President Blatter and FIFA are wrong about synthetic turf being the future for soccer. Natural grass is cheaper, more player friendly, better for the environment, and continues to improve and evolve with innovation for durability and player safety. But ultimately the biggest advantage natural grass has over synthetic turf is the care natural grass receives from dedicated Sports Field Manager. 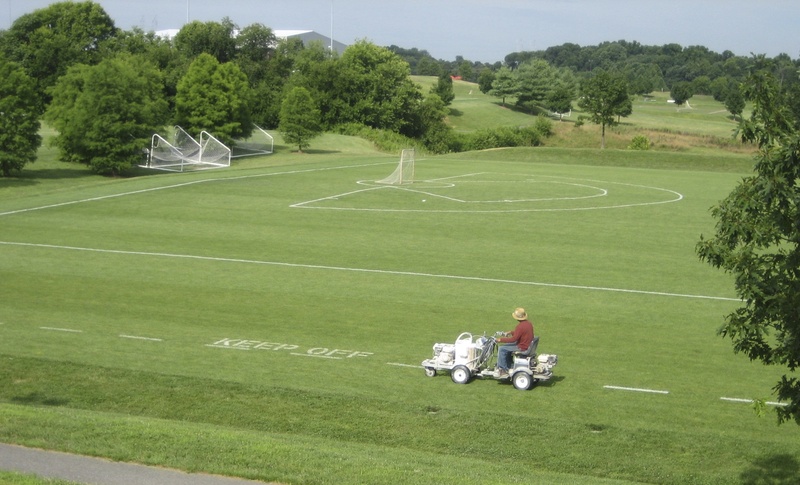 A Sports Field Manager that is provided with just a few tools can provide a low-cost, environmentally friendly surface that players desire and need for long careers. In an age of needed worldwide job creation, FIFA supporting natural grass fields instead of attacking it could create numerous environmentally friendly, green jobs in the sports field and landscape industry. But instead President Blatter and FIFA are advocating for synthetic turf, an industry funded by petroleum, carpet manufacturing, and tire recyclers looking for ways to discard waste. Synthetic turf is not the future for soccer. These 5 reasons illustrate that President Blatter’s statements in support of synthetic turf are not based in fact. The statements are just his opinion. Synthetic turf is not the future of soccer, no matter how much he advocates for it.